Fabric inspection to shrinkage test methods in Garments for apparel merchandising process flow. Fabric inspection process is generally a third part inspection done by buyer nominated inspection company like ITS, MTL etc. The most used and common method of inspection is the 4-point system. In this system every defect is given a point between 1 to 4 based on the nature of the defects. A maximum of 4 points per yards of fabric can be allocated. Fabric having more those 40 points per 100 square yards is considered to be reject. Different customers have different point levels depending upon how premium the brand is and also on the nature of the fabric. For example: a man made fiber should have lesser defects that a natural fiber and hence acceptable points level for polyester is kept lower that that of cotton. the mill segregates the fabric on the basis of shade and makes a shade band. In general a maximum of 3 shade bands are acceptable by customer, however this can again vary from customer to customer. The customer evaluates the different shades by means of a grey scale rating as acceptable. FPT – fabric performance test, yardage from bulk is sent to the nominated testing laboratory such as MTL, ITS for testing the physical and color parameters of the fabric as required by the customer. The testing laboratory also provides a wash care instruction for the fabric, which essentially means the best washing conditions for the fabric. The mill tests 10% of the fabric to confirm that the fabric adheres to the specifications as laid down by the customer. For example if the customer accepts +/- 3% shrinkage, fabric having 5% shrinkage is rejected. The determining the shrinkage the fabric is tested as per the best washing conditions advised by the testing laboratory on the fabric test report. 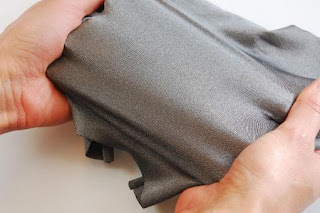 ■Once fabric passes through all the above tests and inspections it is shipped to factory. The factory again checks the fabric on 4-point system and also checks the shade bands and also does fabric shrinkage test to confirm that they adhere to the requirements of the buyer. ■With regards to fabric inspection the factory generally inspects 10% of the fabric, in case there is a problem the factory goes on to inspect 100% of the fabric. For fabric shrinkage test – different procedures have to be adopted for ascertaining the shrinkages for a washed and a non-washed style. ■In case of a non-wash garment testing 10% of the fabric is sufficient to determine the shrinkage that needs to be included in the pattern. The fabric is washed based on the recommended wash care instructions in the FPT. ■In case of a washed garment, 100% fabric should be tested for shrinkage. The test is done as per the wash recipe. Once all rolls are tested, the rolls are segregated as per the shrinkages and different patterns are made to incorporate the shrinkages. ■Factory then also checks the fabric for shade banding, compares the same with the once sent by the mill and if found acceptable sends one sent out to log the same with customer. Once the buyer confirms that the shade bands are ok, the fabric is ready to be cut. A similar process as done for the fabric is done for trims except for pilot trims. The factory can call in trims for sampling and these are called as promo trims.